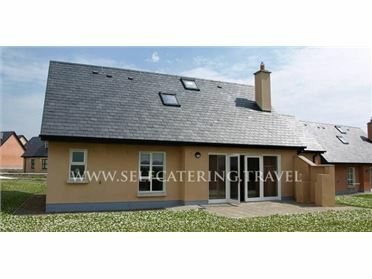 Heaney's Cottage is a wonderful, detached farmhouse in County Mayo, just over the border from Milltown in County Galway. The property has three double bedrooms, one of which has an en-suite, plus a twin room upstairs, and a family bathroom on the ground floor with a separate bath and shower. There is a kitchen, a dining room with a woodburning stove, plus a sitting room with an open fire so you can stay nice and cosy in the winter months. The gardens to the front and back of the property are both lawned so that when the sun is shining you can lay back on the grass and enjoy a picnic lunch. There is off road parking for three cars and lots of country roads and lanes surrounding the property, which are good for walking and cycling. Set in such a beautiful location, Holiday Cottage makes a great holiday home for friends and families exploring the west of Ireland. Situated 30 miles north of Galway City is the village of Milltown. The village is home to a riverside walk, children's playground, tennis courts, picnic area and pubs. Within driving distance is the Lough Mask and Lough Corrib lakes, which are ideal for fishing and boating, plus the village of Cong and Ashford Castle are to be found between these two lakes. The Connemara National Park and the Aran Islands are also well worth visiting. Milltown is in a delightful location for visiting many places of interest.